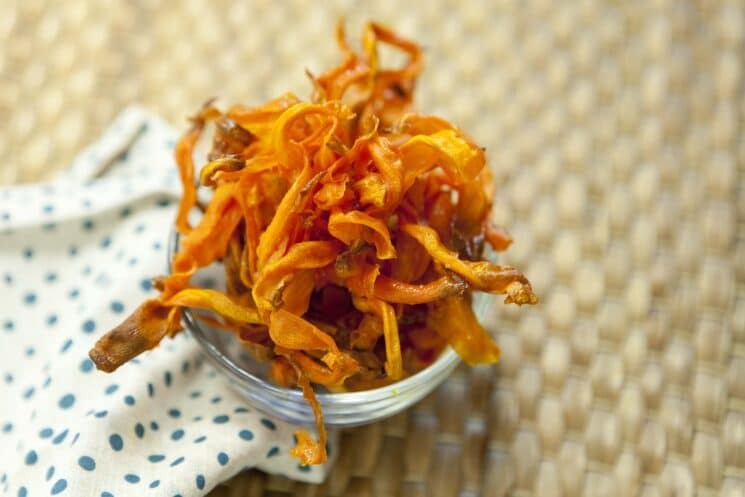 These carrot chips can be addictive! Thank goodness there are only three ingredients! One of our main messages to parents with picky eaters is to try a vegetable in different forms, textures, flavors, and cooking styles. If your child isn’t a fan of raw carrots, he may like them steamed, roasted, blended, juiced, or in some other way. So many of a picky eater problem goes beyond taste and is heavily influenced by texture. 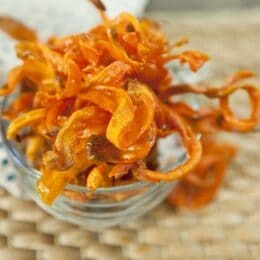 But if it is about flavor, preparing veggies in different ways actually does change the flavor! 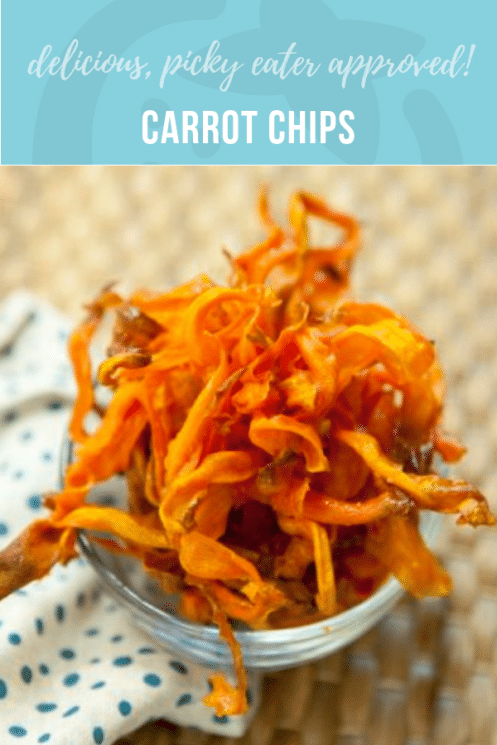 So, when you are thinking about dinner ideas, these carrot chips would make a wonderful side dish! When damage is done to your cells, sickness, disease, and degradation can follow. But foods with antioxidants can slow down the damage, and in some cases, reverse it. Carrots specifically can help slow the damage to skin, eyes, and even immune function. The antioxidants in carrots can also help protect against heart disease and some cancers. Different fruits and vegetables contain different antioxidants, so in order to protect against a wide range of disease, a variety of fruits and vegetables is going to be important. What are some ways to eat carrots? carrot juice Consider including some apple juice to sweeten it up! carrot french toast, Shredding carrots and including it in your batter, and sprinkled on top! carrot muffins If your kids like carrot cake, than they’ll love these! carrot crackers Mmm. cheesy and delicious! carrot cupcakes An Easter tradition of ours! And finally- the way we are going to make them today…. After your slices have been made, simply coat the bottom of a cookie sheet with some olive oil. Lay the carrots slices on the pan, and sprinkle with salt! Bake at 350 for 10-25 minutes. Yes, that is a long span of time. 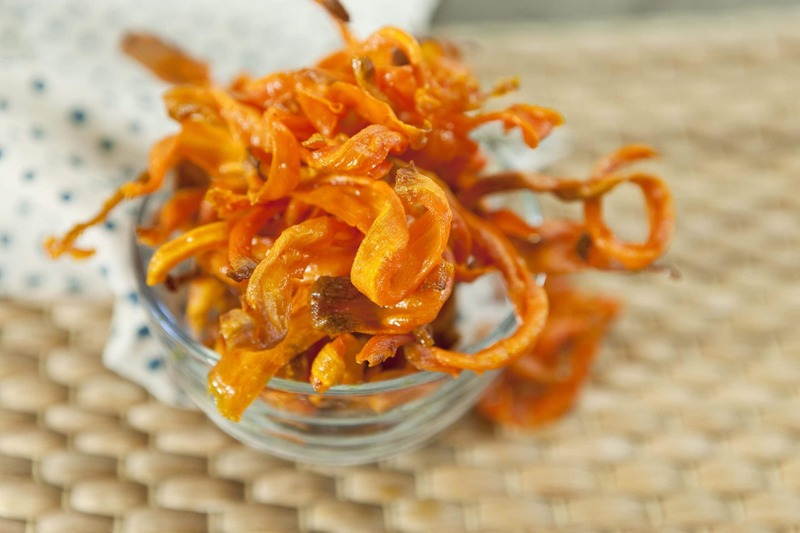 But, it will be different for everyone depending on how thick your carrot slices are. You want them thin and crispy! 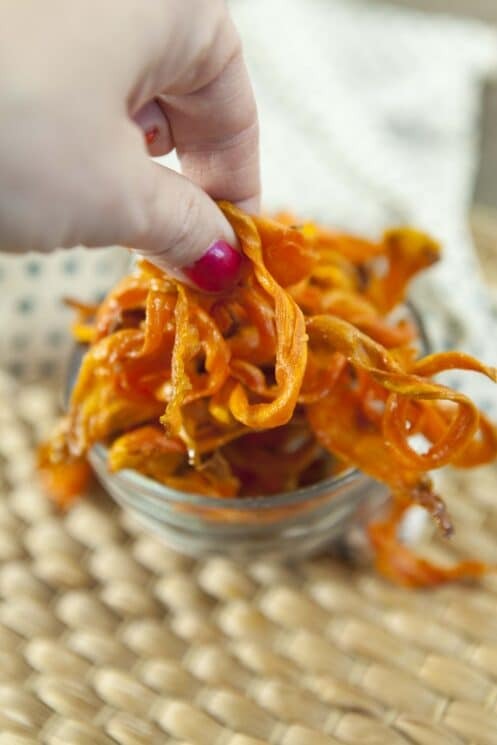 We’d love to hear about your experience trying these carrot chips! Did your kids like them? Love them? Leave a comment to let us know! 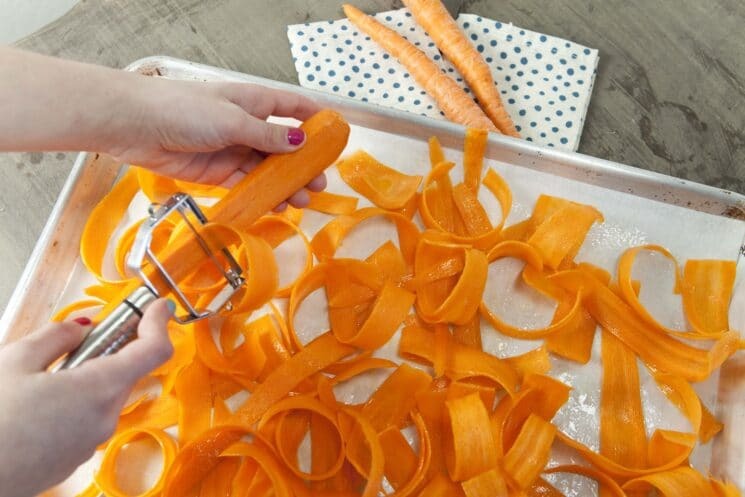 Peel carrots, then slice into strips using the vegetable peeler. 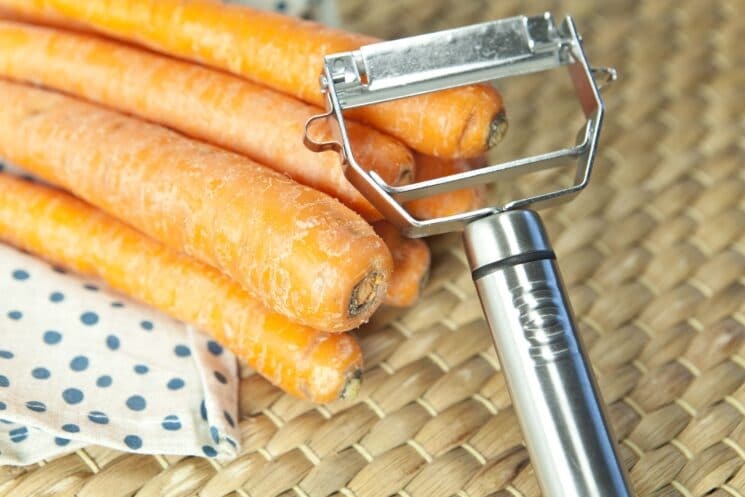 Avoid rotating the carrot for as long as possible to make wider sections; the thicker the pieces, the better they will turn out! Lightly grease the bottom of a cookie sheet with the olive oil to avoid sticking. Place carrot peelings in a single layer on the cookie sheet, tossing them slightly to lightly coat with oil. Bake for 10-25 minutes until crispy (exact time will depend on the thickness of the slices). Hard to find the balance of not soft, not burnt. But it was fun anyways! Did these in the air fryer and they came out awesome!